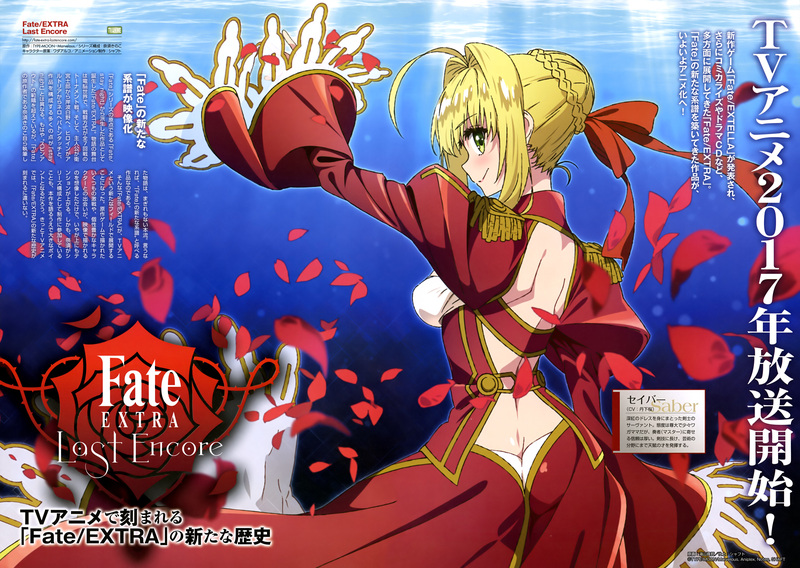 The newest issue of NyanType magazine has a brand new visual for the upcoming anime adaptation of Type-Moon’s Fate/Extra PlayStation Portable game, Fate/EXTRA Last Encore. The TV anime will air in 2017. The visual has also revealed that Sakura Tange (Saber from Carnival Phantasm, Sakura Kinomoto in Cardcaptor Sakura) will voice Saber in the upcoming anime. The Fate/Extra adaptation will be titled Fate/EXTRA Last Encore and is currently slated for air in 2017. The series will be animated by studio Shaft (Bakemonogatari, Mahou Shoujo Madoka Magica) with Kinoko Nasu (Fate/stay night, Kara no Kyoukai) handling the series’ composition. The anime will have its character designs based on Aruko Wada’s original artworks. A Fate/EXTRA TV anime adaptation titled Fate/EXTRA Last Encore is currently in production for a 2017 broadcast. Studio Shaft will handle the animation. Further information about the series will be revealed at a later date.